Photo courtesy of Lara & Terence. Editor’s Note: Lara and Terence are currently traveling the world for a year and dispatching about their experiences for HomeAway. Be sure to follow their travels on Grantourismo and follow their tweets. This article was originally written by Terence Carter on their Grantourismo blog. Being location independent is something we achieved long ago – as travel writers, we’ve been on the road travelling continuously for the last four years, living and working out of our suitcases as we’ve bounced around the planet from one assignment to another. Yet location independence is a topic we’ve actually devoted little attention to. Even now, as we prepare for another year on the road, we have a lot to do – an itinerary to finalize, flights and other transport to sort out, and accommodation to decide upon – but technology is actually the least of our concerns. Sure it would be nice to upgrade some gear, try a few new gadgets out, but we have the basics pretty much sorted out. We’re both Apple users, so I’ll be taking a MacBook Pro and Lara a MacBook. There is no Mac versus PC war for us. As far as we’re concerned, the Mac and the rock solid Apple software best meet our needs. I need a pretty decent-sized screen for editing photos so the 15-inch model is the best compromise. Both our babies have bigger hard drives than standard and have the most amount of RAM that you can put in them – one of the best investments for laptops. I use external drives for storing my photo libraries, as well as storing final images on PhotoShelter for my clients. I’m a little bit nervous about just how much storage I’m going to burn through over the next 12 months as I usually fill a pair of hard drives every couple of months. Why a pair? Every single image has a duplicate on a second drive, updated nightly by the generally wonderful SuperDuper! software. I also carry one of these hard drives and a back-up of my MacBook Pro hard drive with me wherever I go – you never know! I make a backup of my MacBook Pro hard drive nightly. I tried using Time Machine by Apple as well, but it has never ran reliably enough for me. What did I say about ‘rock solid Apple software’? Make that generally rock solid. I use Apple’s Aperture for sorting images (I always get asked this question) and while I have my criticisms of the software, I like it better than other offerings such as Adobe’s Photoshop Lightroom. I also use Nikon’s horrible Capture NX2 to process images because it makes the nicest-looking files and I finish up in Photoshop. For our website, I use BBEdit to edit HTML and CSS files and Fetch to transfer files to our website. Lara uses iPhoto for her images and stores them on the drive in her MacBook, but she’s just about filled up her hard drive, which makes the MacBook run like a piece of cr*p slowly – another little challenge to deal with before we leave. I use a stupid amount of Nikon camera gear and I’m probably going to need all of it for this trip as we could be doing everything from surfing to safaris. Please don’t tell Lara, but at this stage I can’t see me leaving one lens or one flash unit (Nikon SB800s) behind. I carry all my gear around in a Lowepro Rolling CompuTrekker Plus AW. It’s a great bag but it’s rather conspicuous and is always suspected of being too big for the overhead compartments on aircraft. Sigh. I have a Manfrotto lighting bag as well that kind of resembles a golf bag, which holds my light stands and tripod. Depending on the airport and the class we’re travelling in, it has a habit of getting lost or at least arriving late at the gate. Groan. For street shooting this trip, I’m thinking of trying one of the new Micro 4/3 System cameras (stupid name), which is basically a small camera with interchangeable lenses – something like an Olympus PEN E-P2 would be perfect, because some days I don’t want to be seen as ‘the photographer guy’. And no, I never wear a photo vest. Ever. I don’t care how convenient they are! Lara is also drooling over the PEN as she dislikes her very overrated Canon G10, which takes wonderful photos at ISO100 and progressively becomes rubbish by ISO800 – it’s more ‘point-and-pray that there’s plenty of light’ around than ‘point-and-shoot’. As far as other communication devices go, we have several (!) mobile phones. We each have our ‘home’ mobile numbers on a couple of them and we use the others for local SIM cards, which we buy wherever we go. We also have an iPod Touch each – which we both love whenever there is free Wi-Fi around. And speaking of Wi-Fi, we couldn’t live without our Apple AirPort Express for creating our own network wherever we go. Be sure to check out What’s In Your Backpack, Lara Dunston, Professional Travel Writer? and Terence’s piece on backing up your photography. 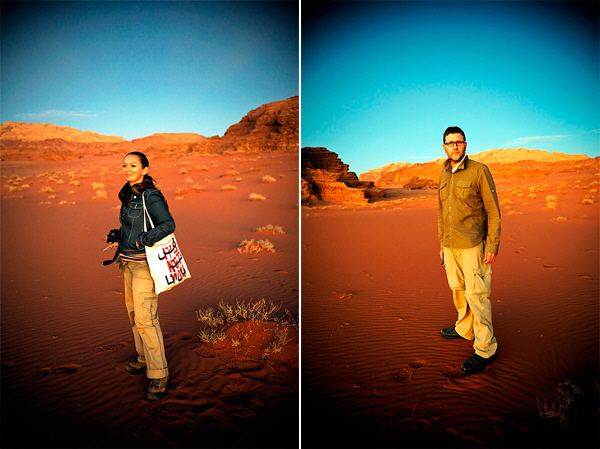 Australian-born and Dubai-based, Terence Carter is a travel and editorial photographer and travel writer. 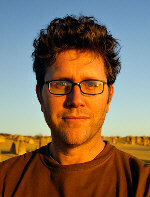 He’s authored more than 40 guidebooks for the world’s best travel publishers, many of which he’s also photographed. Assignments in the last twelve months have seen him making still pictures everywhere from the south of Italy to the Red Centre of Australia. He also maintains a blog – Wide angles, wine and wanderlust.